My fifth grade Tier 3 reading group has been working on improving our basic reading strategies. For the past two weeks, we have been focusing on making connections. 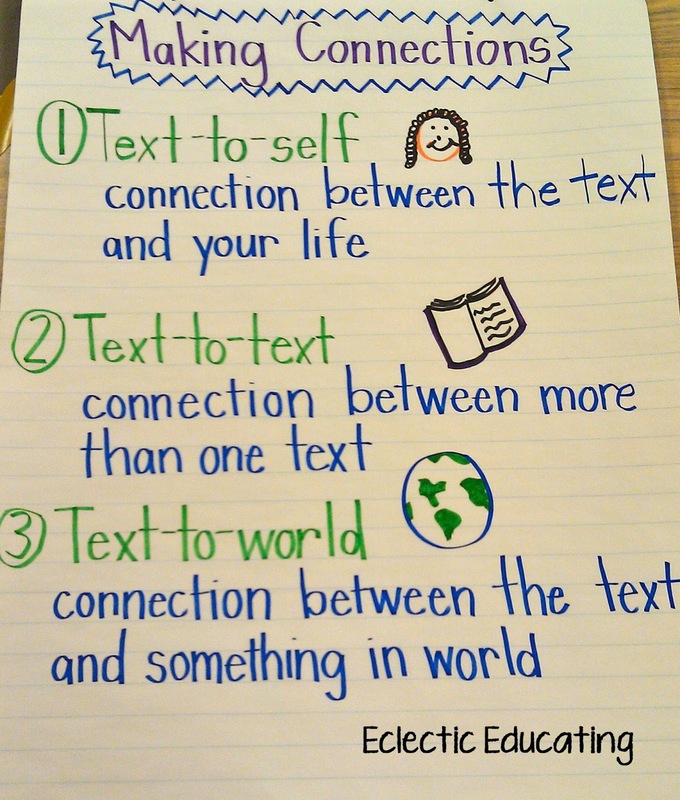 We began by using an anchor chart to go over the three different types of connections: text-to-self, text-to-text, and text-to-world. It was very interesting how certain children tended to gravitate towards certain types of connections. One student had a lot of connections to tv shows, while another had a lot of self connections. (Probably because she is involved in so many different activities.) Another student made a lot of connections to books she had read in other classes. 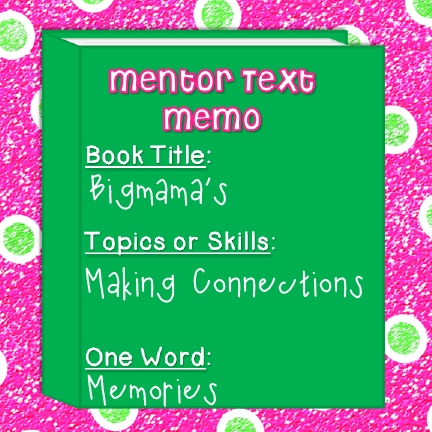 Next, I read aloud the book Bigmama's . I chose this book because it is about a family visiting their relatives. This is something most students will be able to relate to. As I read aloud, we completed a chart of our connections. We recorded what the text said, our connection, and the type of connection. Students also completed a copy of the chart in their reader's notebooks. I decided that my students needed a little more exposure to biographies. I also thought this would be a great genre for making connections. Students would be able to relate their lives to the lives of the people we read about. For our first book, we read about Helen Keller . As they read, the students created a chart for their connections in their reader's notebooks. Next, we read a biography about Alvin Ailey . With this book, students continued filling out their charts with connections. This book was a little more challenging for my students. Focusing on making connections really helped them make sense of the text. 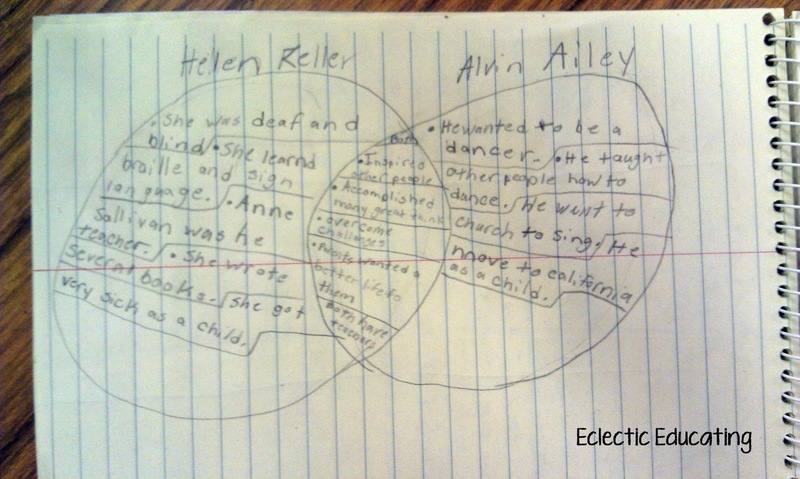 After finishing both texts, we completed a venn diagram comparing Alvin Ailey and Helen Keller. (text-to-text connections!) Both of these individuals overcame great obstacles to become very successful in life. At this point in the lesson, my students were ready to become more independent. 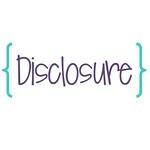 I like to start with articles when I start releasing more independence to my students. I do not want to overwhelm them at first. 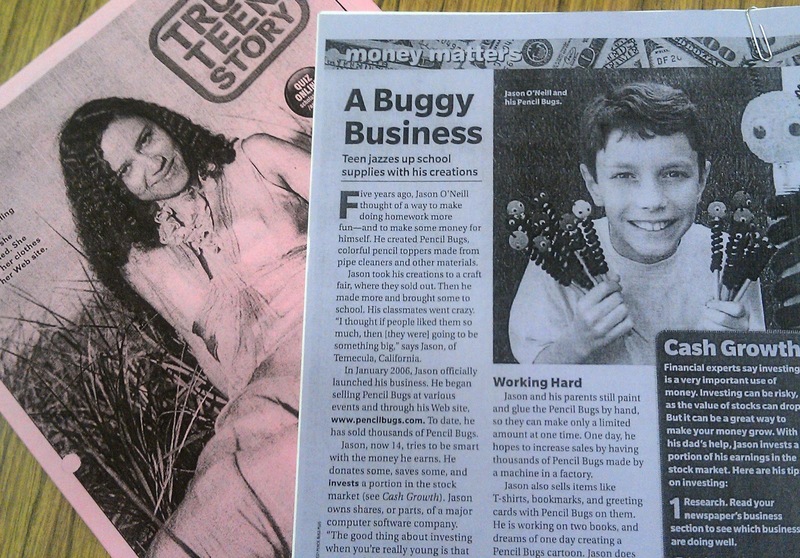 For this lesson, I chose three articles about teen entrepreneurs. 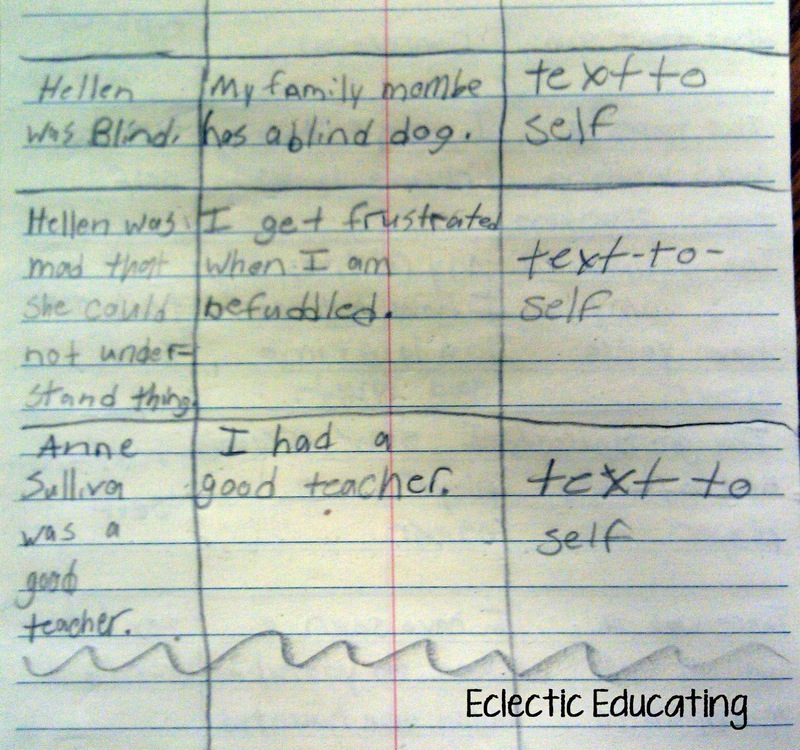 Students read all three of the articles and recorded their connections in their reader's notebooks. Then, students chose two of the teens to compare and contrast with a venn diagram independently. I am very pleased with how the depth of their connections has improved. What types of texts do you use when teaching students how to make connections? I really like your anchor chart! I did not teach connections explicitly, but kind of wove them in throughout the year. 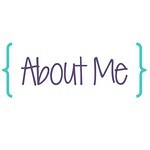 I think I will start the year off with making connections next year, because it is so important and it does help them understand much more about themselves and the books they are reading. My kids always seem to have the hardest time with "Connections to the World" - maybe they just don't have enough life experiences or social awareness yet. I like to put up small pictures of the books that we have read under theme headings to help with the text to text connections. Thanks for sharing these ideas, a great reminder of skills I need to review before our testing. 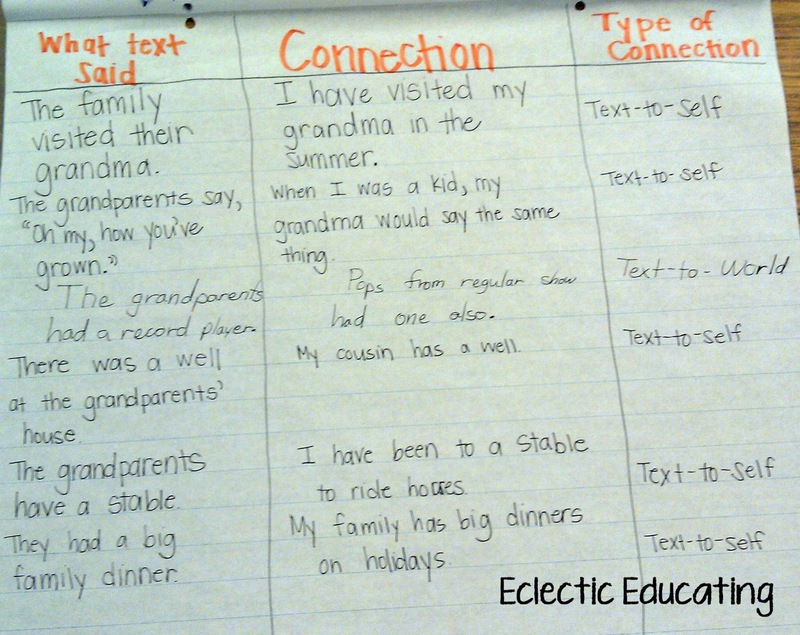 When I taught 6th grade reading they really had a hard time with text to text connections because they hated reading. Sigh. Love your chart and the way you taught them how to make connections and write what the text said! I love the charts and those are books I have never seen! I love using Patricia Polacco's book My Rotten Red Headed Brother for making connections because most kids have a sibling that this reminds them of, but it has a sweet message too. I'm glad you linked this up! Love the anchor chart. I have read a few of Donald Crews books, but not this one. Thanks for sharing this Amy. 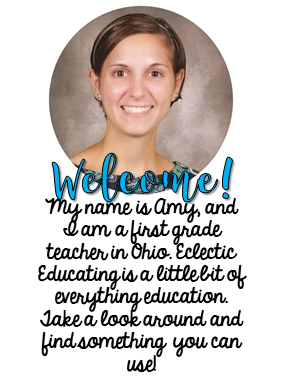 I am pinning it to go with a unit I like to use at the beginning of the year when I am modeling lots of comprehension strategies for my students to use in their Book Talk notebooks. This will be a great lesson to teach those connections! YAY! Thanks! Love the books you suggest in this post! Thanks for the great ideas! Your students sure were busy making connections- love the anchor chart and all the book ideas!